It’s a little ironic that I’m writing this post about iPhone apps using WordPress on a Motorola Droid (Devour actually), but it allows me a chance to experience how hard it is to blog, using a tiny tiny tactile keyboard and also finally get this post started. Ah, back to a full sized Logitech keyboard and mouse. Much better. Popularized by iPhones, there are apps for just about everything, including tools to help social media marketers on the go. In fact, there are over 100,000 iPhone applications to choose from. Many of those apps are extensions of social media sites such as Facebook and Twitter. Others serve as productivity tools for more efficient social web participation or for content creation. 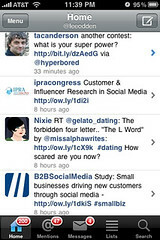 Echofon – Twitter usage on iPhones must be out of this world and while there are many great apps for Twitter including Seesmic, Hootsuite, Tweetie and Tweetdeck, I like EchoFon the best. It’s amazingly easy to switch between multiple accounts, its fast and there’s an auto-complete feature when typing in Twitter handles that saves a lot of time. It works with lists very nicely but does not offer scheduled tweeting, which I don’t personally use much anyway. 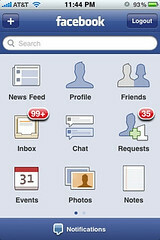 Facebook – I probably use Facebook more on the iPhone than through the web site. 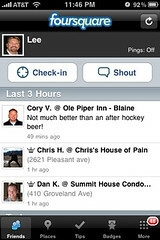 Personal social networking or networking as an individual on Facebook is pretty easy to do with the app. What I’ve pictured below is where I also get a lot of productivity, which is being able to manage our blog’s fan page. We’ve gone from about 80 to over 1,400 fans in about 3 months and the convenience of adding to discussions via the iPhone has a lot to do with that growth. Foursquare – You know those social media shiny objects that you’ve come to avoid but then they gain so much momentum and buzz that you have to try it out and then you end up liking them? That’s my Foursquare experience. It was the same with Twitter. Using Foursquare for marketing as an individual isn’t as obvious as what one might do with Foursquare location based advertising. However, it can be pretty handy at conferences and events for announcing/leaking certain kinds of information. 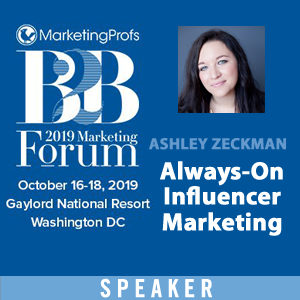 As a retailer or other business with a brick and mortar presence, can you imagine how useful it would be to know who your most active consumers are that are also active on the social web? LinkedIn – While I’m not always by a computer (can you believe it?) I almost always have my phone with me and that makes accepting LinkedIn invitations (or not as you can see below) easy to do. Status updates are easy to do and can be seen by as large a social network as you care to develop. 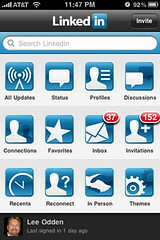 Thus the LinkedIn iPhone app makes it easy to feed that network. Quality trumps quantity here by far. UStream Live Broadcaster – Capturing live video and audio plus the ability to poll viewers and promote on Twitter seems like a fantasy app for a social media marketer. Especially when you’re at an event and you want to capture something and get it out immediately. 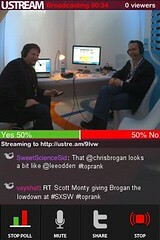 It’s amazing how easy the UStream iPhone app (U Broadcaster) makes this process. Flickr – Capturing and sharing images is an essential part of digital asset marketing and social media marketing. The Flickr App makes it pretty easy to upload and manage images taken with your iPhone. 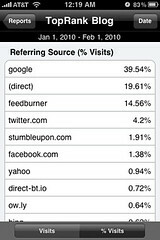 Google Buzz – Privacy issues aside, there’s plenty of buzz about Google Buzz and the only way I’ll use it is on my iPhone. 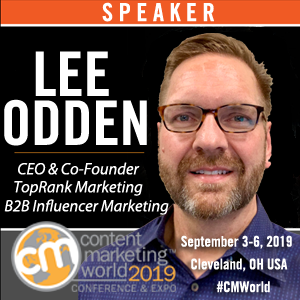 Let’s face it, with Google’s dominance and momentum, you can’t afford not to stay on top of their obvious efforts to become a social media powerhouse. It’s not exactly a standalone app though. 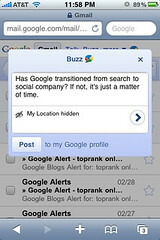 However, Google makes it easy to add a bookmark to Buzz on your iPhone from Gmail so you can use it directly. 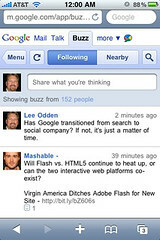 Update via Mashable: Apparently there’s a new app called Buzzie for Google Buzz on the iPhone. 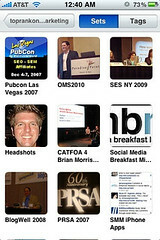 AudioBoo – This is a handy tool for capturing and promoting on-the-move podcasts. It’s really a no-brainer except when you’re like me the first time I interviewed Vanessa Fox for a podcast and held the iPhone right side up, which for podcasting with an iPhone, is upside down since the microphone is on the bottom. Doh! 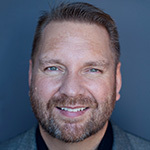 AnalyticsApp.com – What good is marketing online if you’re not MEASURING? For those with Google Analytics implemented on their sites and blogs (who doesn’t?) this app gives you insight into all the details of web visitor data you’ve come to love with GA.
Are these the bestest, newest and most awesome iPhone apps for Social Media Marketers? For this marketer, the apps I’ve listed above take care of 90% of my mobile social media needs. In fact, 4 or 5 would probably do the trick. 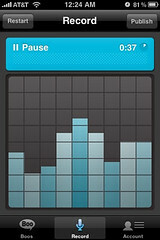 I do wish there were more social media monitoring iPhone apps though. Especially those that offer Social CRM functionality with your contact list. I’m also keen on finding task management apps that work well with Outlook. 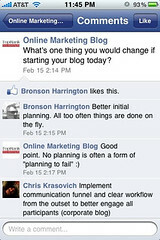 What are your favorite iPhone apps for social media marketing? Thanks for this, definitely downloading the UStream app. 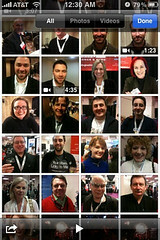 One app you didn't mention that I have used many times is Twitvid. Super easy to use and post. It hasn't failed me yet. I hadn't heard of Twitvid Indra, thank you for the heads up. Use them all apart from buzzie which I'll now try. My6sense is cool. Tweetie2 is a must. Netnewsire good too. Thanks for the heads up on My6sense – I certainly need a better filter. Lee – you got most of my favorites. While not really in the same category, I also am addicted to RankTouch which gives real-time graphs and data on my books’ Amazon sales rank. Awesome list, Lee. I'm partial to the WordPress app as well. Nothing beats it for a blogger who needs to correct a misspelling, change a link or even publish a full post on the fly. Great list, though. Thanks for the point to AnalyticsApp. Didn't know about that one! Lee, great list (although I question the need for 2 smart phones…how smart can one man be?). I use all of these currently, and think you missed both Loopt and Blogger apps. I like using Blogger to help manage the client blogs I use there (mainly for typing corrections and link corrections as Jason mentions) and Loopt for stalking my friends/family and Social Media contacts! Thanks as always! I'm testing the droid out and will eventually use it as a giveaway on our blog or to our staff. It simply doesn't compare to the iPhone. Thanks for mentioning Loopt – I haven't looked at that in a while. Great post, Lee. The Ustream Livebroadcaster took me by surprise. That's a definite win. As far as Google Analytics goes, I also recommend that your readers check out AnalyticsPro and BAM Analytics Pro. These two relatively newer Google Analytics apps are a little pricier than Analytics App (which is also a great app! ), but the extra cash is worth it for complete Google Analytics junkies. They all render beautifully on the iPhone, which doesn't come as a surprise. Excellent, thank you for the suggestions Josh. Does the Analytics APP allow for viewing of custom reports? No it doesn’t. That is why I disagree with the last App shown. I recommend BAM Analytics Pro. Why? Well it includes Custom Reports and the latest update (released today) allows Advanced Segmentation!! Hey Dan, reports are limited to Visitor, Traffic, Content, Ecommerce, Site Search, Event Tracking and Goal Reports. Nothing for custom – at least not yet. I'm in total agreement on the Foursquare experience. The addictiveness kinda creeps up on you. As for Linked-In's app, they have made huge strides from the earlier version, but I still don't find it overwhelmingly useful. I agree, the first iteration of the LinkedIn app was rather useless. The current app is one I use to see friend requests but I don't do much else with it. What would be nice is if these apps could do something different than what can be found on the web site and that's specific to a mobile experience. I want an iPhone! Blackberry's are great for business but they are not as fun as Apple's masterpeice. Thanks Lee. Definitely on the shopping list! the Ustream is really cool app. I will try it out as soon as I upgrade to 3GS. Hi Karmia-Catherine, I neglected to mention the 3GS requirement for Ustream. 🙂 Maybe I can start using it more now that I've included in my favorites list! Great article! This is a two-thumbs up new on social media and iphone apps. You can take it anywhere, anytime and in your most convenient way. Great to see this being discussed, I was just looking for information on all of these type gadgets and know zip, nada. Thankyou. Good call Matt 🙂 Great seeing you in San Diego – looking forward to SES NYC. Sharp 32″ Aquos HD-Ready LCD TV…. €500 euro. As soon as final conclusions are done from you kindly contact us as soon as possible so as to lead you on how to transact with us. Wow, this was very resourceful! To the Appstore I go! LOL. Great list of resources. I have made a note to try the analytics app. I wonder how many of these apps will be used regularly this time next year. I have a new app for you! the name is Tvider. You can send video, pictures, audio, through your twitter account and it is free. Nice list! Very helpful! Thanks! great article, im a blackberry user, but iphones seem to be dominating. Very interesting read. 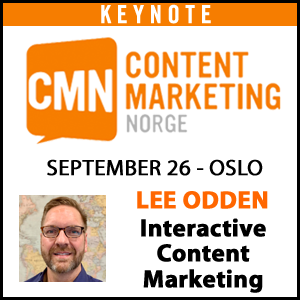 Great list Lee! Didn't even think about the UStream Broadcaster! Going to need to get that one. I agree about the Twitter app…Echofon is one of my favorites. I love the auto-complete for the same reason I love Tweetdeck as a desktop app. I have completely fallen in love with Foursquare as well. Trying to get some of my clients to adopt it. Again, great list! to have iPhone Apps for Social Media Marketing too……………….. I will give you a million dollars if you can. Scratch that. Be sincerely thankful if you can tell me an app that lets my use files listed in ringtones on itunes as actual ringtones on my iphone. But great info anyways. Thanks for all the useful information, Lee. This is my first time to your blog, but definitely not the last! Thanks again! Thats really a great collection of apps Lee. I can definitely relate to this article. I have an Iphone myself it's pretty much been attached to my hand ever since the day I purchased it. I am constantly checking gmail and facebook throughout the day, pretty much every 5 minutes (and I know I'm not the only one). To know that there are applications that can be used for marketing on the Iphone must make it a lot easier for companys to get exposure and get their name and services out there. I wouldn't be surprised if Iphone applications took over as the #1 marketing tool to use!